Many cats and dogs will have ear infections at some point in their lives. When this condition is not noticed and treated properly in good time, this may affect the animal's hearing. In this article, we discuss how you can recognise a possible ear infection and what to do about it. Ear infections are a common problem in cats and dogs. The animals will shake their heads, scratch their ears and sometimes whine with pain. The outer ear canal can be dirty and red, but the ear itself (the inner ear canal) can also be dirty, red, warm and often smelly. In most cases, the ear canal is infected. Sometimes your pet will have Otitis media (an inflammation of the middle ear). The risk of too much shaking and scratching is an othematoma. You will see a huge swelling of the auricle that has to be treated or operated on 10 days after it occurs, due to the healing period of the blood vessel in the auricle. If this ear is not treated properly, a very painful condition called cauliflower ear will occur. All dog and cat breeds can contract ear infections. In dogs, certain breeds are more likely to suffer from ear infections than others. These include Cocker Spaniels, German Shepherds and Golden Retrievers. In dogs and cats that love the outdoors, ear mites are a significant cause of ear infections. They are small, white, spider-like insects that live off ear wax. They cause itching and are so small that they can barely be seen with the naked eye. They can cause severe itching for the head and neck, which sometimes lasts for several weeks after the mites have been eradicated. In addition, there are various types of bacteria and yeasts that also like to live in the ear canal and cause problems there. The symptoms of an ear infection are quite easy to spot. The animal might flap or scratch at its ears or sometimes whines with pain, keeping its head tilted. The inside of the auricle is often red and dirty. What's more, it can give off a highly unpleasant smell and the ear may "run". In cases of otitis media, your pet's balance may be affected, making the symptoms worse. Your pet will often walk around with its head tilted and may develop a balance disorder, sometimes even walking around in circles or falling over. 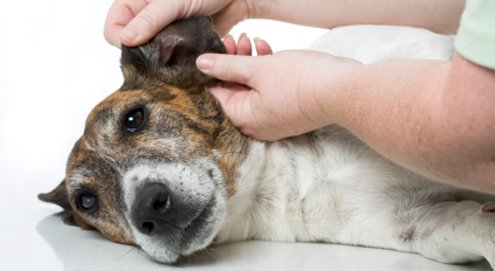 A thorough examination is important for every animal with an ear infection. Your veterinarian will have to check whether your pet is infested with ear mites and/or whether it has an infection as a result of bacteria and/or fungi in the ear canal, or whether something else is going on. Sometimes additional tests are needed. These may involve a swap or ear wax culture, or even x-rays of the skull. When your pet has an ear mite infection, you can use an effective ointment containing an insecticide. For infections caused by bacteria or yeasts, antibiotics or anti-fungal creams are needed. When the ear canal is very dirty, the ears will be rinsed out first, with a mild anaesthetic. For animals that are in a lot of pain, painkillers or anti-itch tablets can be prescribed to reduce the pain and itching. In a middle ear infection, (long-term) treatment with antibiotics is needed. Animals with recurring or chronic infections may suffer from clogged ear canals. Make sure you check for swelling and foreign bodies, because a clogged or damaged ear drum can lead to (near) deafness. In dogs or cats that are sensitive to ear problems, it is important that you prevent symptoms where possible. The best way of doing this is by regularly cleaning the ears (and the ear canals) with an ear cleaner. For example, you could choose to do this once a fortnight or immediately after the dog has been swimming. Examples of products you can use for this include Monoclean, Epi-Otic, EpiSqualan or HexoClean. If your dog is not showing any symptoms, you do NOT need to use these products. Please note: never try to clean the ear canal with cotton buds! In cases of light irritation or redness of the outer ear canal, Dermiel ear drops can soothe the symptoms and promote a quicker recovery. What's more, these symptoms can also be treated naturally using Puur Ear. If the symptoms persist, or if your pet has severe ear problems, we would advise you to consult your veterinarian. In a number of cases, ear problems (particularly in dogs) can be caused by a hypersensitivity to food. If you choose to feed your pet a hypersensitivity diet, it is important that you exclusively give them this food for 6-8 weeks, as this is the only way to assess the effect. If the results are positive, the animal can be fed this diet permanently. Do you have any further questions about ear infections in cats and dogs or about ear problems in general? Please contact our veterinarian by phone on 020 3191 8322, or via e-mail at: veterinarian@vetsend.co.uk. Helps reduce irritation of the outer ear canal. Ear cleaner for cats & dogs. Wax-dissolving ear cleaner for cats & dogs. External ear cleaner for dogs & cats. Routine cleaning of ears & removal of earwax in cats & dogs. Against ear infections & ear mites. Ear cleaner with a low pH.